Want add some Mouse to your merry? 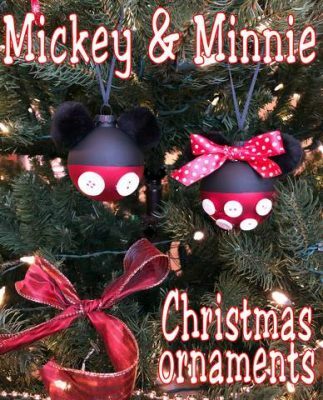 Try making Mickey and Minnie Christmas ornaments for the tree! These decorations are simple to assemble and add a touch of Disney to your home and holiday. All of this cost me less than $20 and I had supplies to make up to a dozen ornaments. 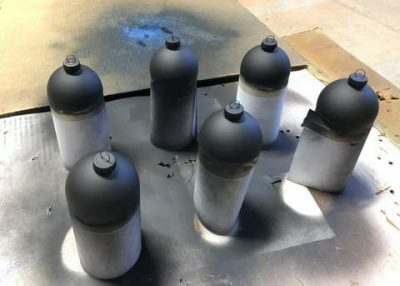 First, use masking tape and some scrap paper to tape off the bottom half of each ball as evenly as possible so you can spray paint the top half black. 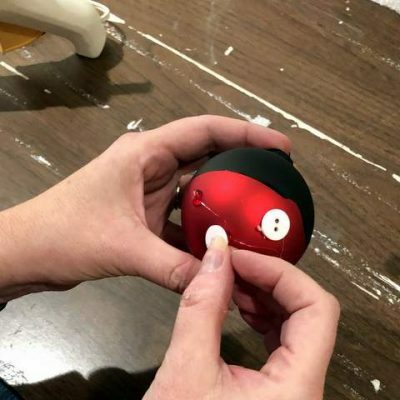 You could also start with clear ornaments, but then you would have to paint both the red and the black — starting with one color already present makes it half the work! 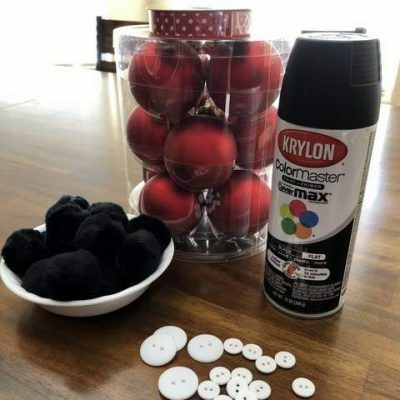 Next, spray paint the upper half of each ornament black. 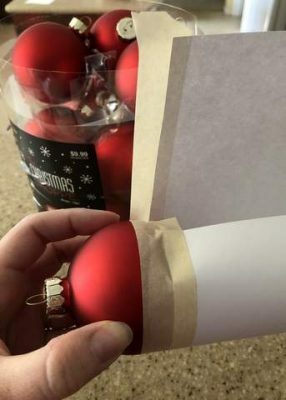 The paper wrap around the base made it easy to hold the ornament while spraying to get good coverage. I chose to paint the top hook attachment of the ornament so it would blend in, but you could remove it before painting to keep it gold. 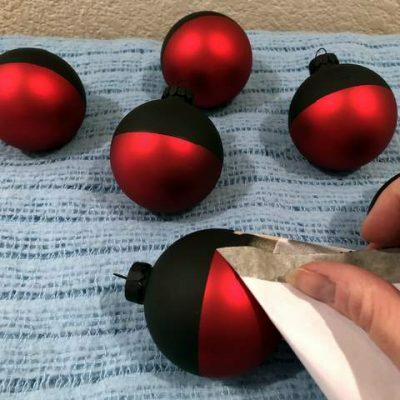 My ornaments were a matte red, so I chose a flat black spray paint to coordinate. If you have shiny ornaments, a glossy black would look better. Two coats of paint were enough to cover well and touch up any red that was missed on the first coat. 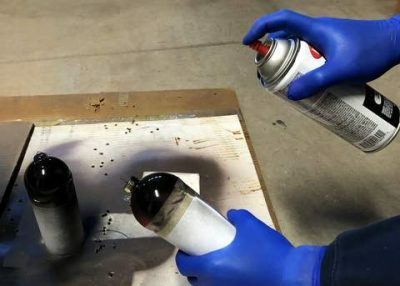 After letting the paint dry thoroughly, carefully remove the tape. Pulling downward toward the base of the ornament helps keep the paint line from peeling unevenly. Now comes the fun part! Add buttons to the red half of each Mickey and Minnie Christmas ornament — two large buttons for Mickey, or four or five small buttons for Minnie. I used hot glue, but superglue would also work. 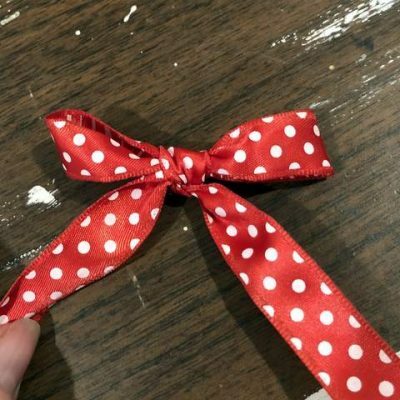 Minnie needs her signature bow, so make small, size-appropriate bows out of your polka-dot ribbon. 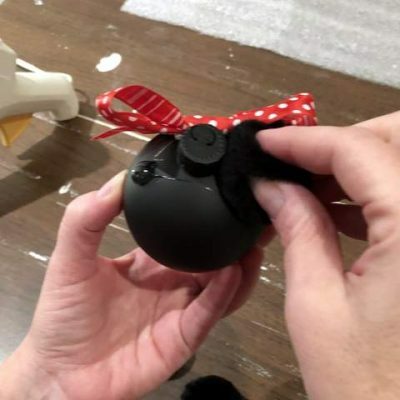 Attach the bows with glue to the top front of each Minnie ornament. The ears are the secret weapon of this ornament. Pom-pom ears scaled correctly make this a more realistic ornament than some crafted versions that use smaller ornament balls for ears (to me they never look right). Glue two pom-poms on top of each ornament. Hang your Mickey and Minnie Christmas ornaments using thin ribbon. I used some black grosgrain ribbon left over from another project, but you could use more of the polka-dot ribbon, yarn, or curling ribbon from gift-wrapping. 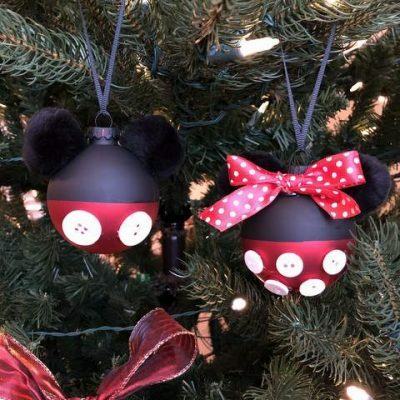 These Mickey and Minnie Christmas ornaments will add a subtle touch of Disney to any Christmas tree with very little work. Make a few for yourself and some to give as Christmas gifts! Have you crafted any Mickey-shaped ornament for your Christmas tree? Share your suggestions in the comments, or on Facebook or Twitter!